As the much anticipated release of the Air Jordan "Slam Dunk" collection arrives this weekend, we realize that many people may not actually be familiar with the history behind the shoes. 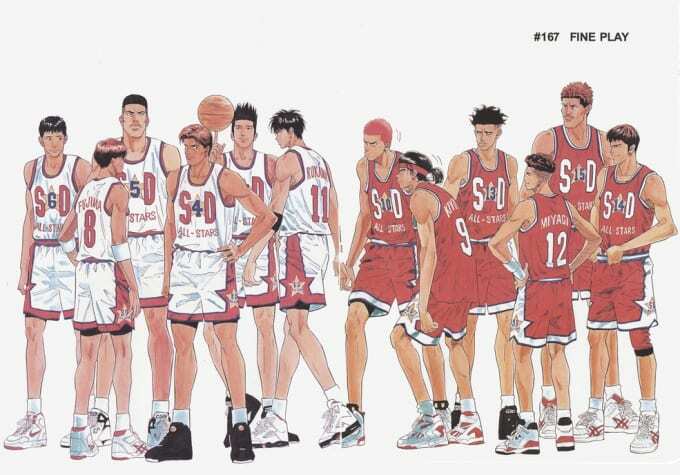 The pack is inspired by the Japanese sports manga series called Slam Dunk and was published from 1990 to 1996. The story follows a young high schooler named Sakuragi Hanamichi, a troublemaker and gang member known for getting into fights, and because of this girls weren't into him. But in his first year of school he meets Haruko Akagi, a girl unafraid of his past and one who sees more in Sakuragi. Reluctant at first, she encourages him to join the school's basketball team and that's where Sakuragi really begins to flourish as he tries to impress her with his athleticism and skills on the court. Slam Dunk is a story of hardships, friendship, and love, but it's also a dope series for people who just love basketball and sneakers. It's no wonder why the cult classic sold over 120 million copies in Japan alone and is one of the best-selling mangas of all-time. As most sneakerheads would know if they followed the series, the players on the team usually wore heat and they weren't always strictly Jordans. To give you an idea of some of the dope sneakers they rocked, we rounded up The Best Sneakers from the Slam Dunk Manga and Anime Series.